Choosing the proper tires.There are two basic types of tires . . . Tires are critical. The air in them is your primary suspension and their construction determines your traction, cornering, and acceleration. A small investment in new tires can make your bike feel like new. Tread material. Softer gives greater traction, harder last longer. Tread Pattern affects traction, rolling resistance, braking. Generally the smoother the surface you ride on, the smoother the tread pattern you can use. Casing makes your tire feel squishy, comfortable, or stiff. Tire Liner is optional for increased resistance to tube puncture. Bead is the edge that holds it to the rim. Rim strip protects your inner tube from puncture by the spoke. Ask The Bike Shack about your tire options from Continental Tires. 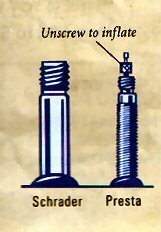 Know the tire valves on your bike. Your wheel rims have holes to fit inner tubes with either Presa or Schrader valves. When using your pump, or buying replacement tubes, make sure it fits. 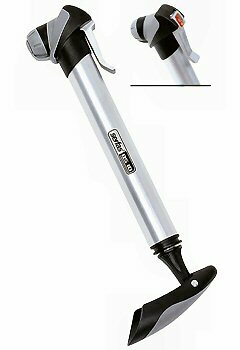 Frame Mini Pump a great little pump automatically fits both Presta and Schrader valve. Air is free and pumps are cheap. Always be prepared, carry a pump, a patch kit, spare innertube, and always, use a gauge to check your pressure. Tire pressure makes a HUGE difference. Correctly inflated tires last longer, roll faster, corner and brake better, and ride more comfortably. Even 10 lbs. too little pressure can slow down, cause sloppy, even dangerous steering, improve your chance of damaging your rim. Larger diameter tires hold more air so they can be gentler to ride on. If you're over 150 lbs. 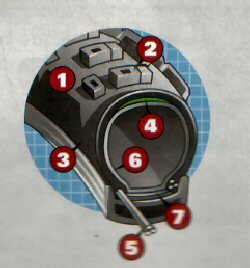 , or want more cushion, look to wider tires.